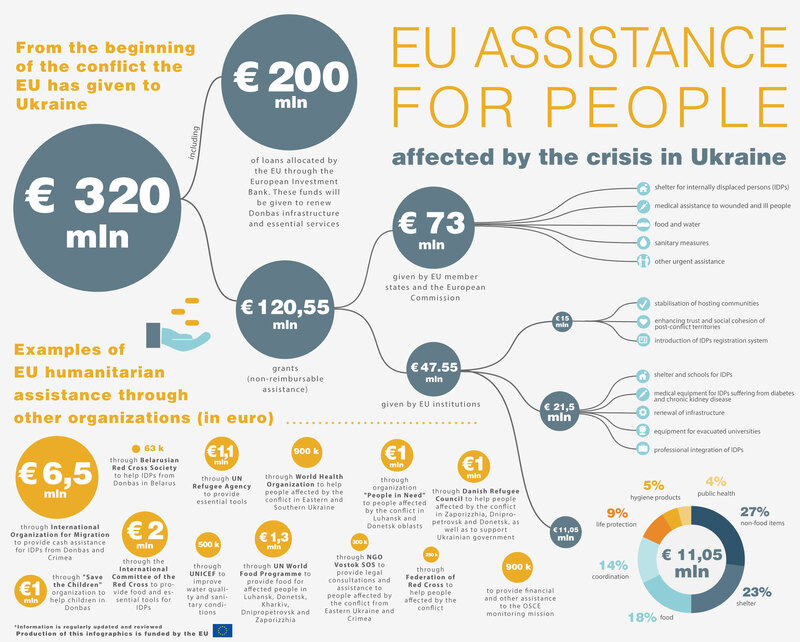 The EU is the largest donor of assistance to Ukraine, including humanitarian aid. Public opinion does not always attribute these funds to the EU, since the EU provides them not directly but through its partner organisations, including UN agencies, international NGOs like the Red Cross Movement or Save the Children, NGOs based in EU members states like the Norwegian Refugee Council, the Danish Refugee Council, or others. When an internally displaced person gets assistance from the UN, for example, this could be EU money. At the same time, the humanitarian catastrophe in Ukraine is so big that even millions of euros is never enough. According to different estimations, there are 600,000 – 900,000 internally displaced persons in Ukraine, tens of thousands of wounded, and thousands of families who have lost husbands, wives or children. This is the situation with which humanitarian agencies are faced. They need to make difficult decisions on which needs to prioritise and whom to help. In order to understand how the whole system of EU humanitarian aid works, through which organisations it is transferred, how needs are assessed, and how priorities are defined, we decided to talk to Mamar Merzouk, head of the Ukrainian office of the EU Humanitarian aid and civil protection department (ECHO). Our interview took place on the eve of the visit of the EU Commissioner for humanitarian assistance, Christos Stylianides, to Ukraine. First, let me ask what is the scope of the EU humanitarian assistance to Ukraine right now? To date we have provided some €11 million of humanitarian aid to Ukraine through the ECHO (Humanitarian Aid and Civil Protection). This €11 million is for emergency humanitarian aid. On top of this, we allocated €17 million from the regional development programme to speed up the repair of the accommodation centres, and €4,5 million from the instrument for stability to peace-building initiatives in the communities. By the end of March all humanitarian aid funds will be spent. We have already announced another €15 million in humanitarian aid to meet the growing needs. There is also €73 million in aid which comes from the EU member states’ contributions. How do you decide what amount of financing will be allocated to Ukraine, and how do you conduct the needs assessment? Our system of decision-making is based on appeals by either national governments or the United Nations. In this case, the appeal was issued by the United Nations in August 2014. Responding to this appeal, ECHO contributed its assistance. The same goes for other crises, in Syria and other states, where an international humanitarian appeal takes place. When conflict occurs we conduct needs assessments and, based on these, we outline the needs and ways to intervene. Based on this information, which the ECHO receives from the UN and other partner organisations, as well as based on our own field analysis, we decide the priorities to allocate money. How do you control whether the money is spent properly? We only provide funding to the UN, the Red Cross, or recognised NGOs. That is why the ECHO office is here. Our role is to monitor the allocated funding. We organise field missions to meet with the beneficiaries who receive our assistance. There is a whole system that allows checking whether the money goes in the right direction. How does the whole EU humanitarian aid system function? Do you work with partner organisations, or does the EU go directly to people and provide humanitarian aid itself? The specificity of the ECHO is that we have preselected partner organisations that signed a framework partnership agreement with the European Commission and specifically with the ECHO. We cooperate with such partner organisations as the Red Cross movement, UN agencies, the International Organisation for Migration, etc. What organisations are your partners in Ukraine? In Ukraine we cooperate with IFRC (International Federation of Red Cross and Red Crescent Societies), Save the Children, the Norwegian Refugee Council, the Danish Refugee Council, People in Need, the UN Refugee Agency, the World Food Programme, unicef, the World Health Organization, the International Organisation for Migration, and others. So if someone in Ukraine gets assistance from UNICEF, for example, it could be EU money? There are over 600,000 internally displaced persons in Ukraine with diverse needs such as shelter, heat, food, and transportation sometimes. How do you prioritise to which needs you will respond? We cannot cover all the needs, of course. There are also other EU Member States that contribute directly and other countries that are helping. Our priorities are usually the life-saving support to people, to secure that they are not on the street, they are not sick, etc. It’s like when you ask a doctor what he would do if he faces a car accident and the people are bleeding. Will he give an injured person an aspirin because he/she has a headache? No, he would first stop the bleeding. And when you stop the bleeding, you transfer the injured person to the hospital. In other words, there are steps to be done. The ECHO priorities depend on the particular case in the same way as a doctor treats each patient depending on his/her disease. The EU assistance can include, for example, cash payments, medical assistance, etc. One of the globally-recommended practices is to provide cash for people so that they pay for their rent, buy goods, etc. This is one of the practices to support people in a dignified way. Another option is health assistance – we provide medicines to people, for example, those who need insulin or other treatment. There are many other types of aid too. The cash programme [when humanitarian organisations distribute cash to families – ed.] might be an efficient tool. Each of the families have different needs to cover, so it is more convenient for them to get cash assistance and buy what they need. For example, one family needs to buy more medicines for their children, another one needs money for rent, etc. We provided cash assistance for people in Kharkiv and Dnipropetrovsk, because these are the cities with the majority of IDPs, where the vulnerability of people, according to our partners, is higher. Do you have fixed amounts of cash support? Yes. It is about 300 [US] dollars. Initially the idea was to roll it out monthly, but because of the scale and number of people, it is given once to a big number of people. There is always a challenge: either you cover a few people with big support, or cover more people with smaller support. How many people have received this cash aid? We reached about 2,000 families in Kharkiv through the International Organisation for Migration, and we reached about 3,000 people through Save the Children. But this is only one type of support. What should an internally displaced person do to get EU aid? An IDP can ask for aid through local NGOs like Save the Children in Dnipropetrovsk, or the UN Refugee Agency in Kharkiv. People also can contact UN Office for the Coordination of Humanitarian Affairs, or contact us directly. Do you also provide aid in Donetsk and Luhansk oblasts? Yes, we provide aid in these regions through our partner organisations: the Red Cross, UNHCR and international NGOs with experience and expertise working in such countries as Somalia, Syria, Iraq and others. Do these organisations face some restrictions to their work? Do you face bureaucratic obstacles to your work in Ukraine? There were some issues related to putting in place legislation that allows the smooth provision of humanitarian aid. There were some good initiatives, like the law on internally displaced persons, but there are still some taxation issues about the beneficiaries and humanitarian organisations that have to be addressed. I want to stress that our role is to focus on the affected civilian population. The more you have access to them, the better to provide them with assistance – before it is too late. Because, at the end of the day, you want to save people’s lives.